Samridhi Luxuriya Avenue is constructed by Samridhi Realty Homes that comprises of 2 BHK and 3 BHK apartments along with commercial shops offering extravagance and opulence a new meaning. The project is tactically located at Sector-150 Noida. The locality has lured a lot of development and given growth in real estate industry. It is crafted in a remarkable way to give lively and happy surroundings. It is developed with unique architecture and features at an inexpensive rate, providing the best deal for buyers. Sector-150 is one of the most rapidly developing area, located near the Yamuna Expressway. The well-developed neighborhood planned connectivity features, and projected growth are some of the reasons that are getting the buyers attention here. Sector-150 Noida planned to become the first green sector of NCR. The sector has multiple group housing projects consists of flats, villa, and plot. Sector 150 is adjacent to developed areas such as Chi 2, Chi 5, Omega, Phi 2, Sector 151, Sector 153 and Tech Zone. It has many well-known schools in the vicinity. Samridhi Luxuriya Avenue is also ideal for the investors who want to avail great returns in the years to come as this area is developing very fast and is indicative of a good number of people settling down here. Where is Samridhi Luxuriya Avenue located? Sector-150, a prime residential locality for house seekers in Noida. What apartment sizes are available in Samridhi Luxuriya Avenue? The project offers apartments sized between 1165.0 sqft and 1690.0 sqft. 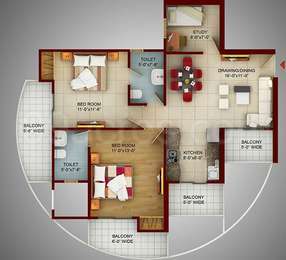 What is the 2 bedroom size in Samridhi Luxuriya Avenue? 2 BHK units in the project are available in a size of 1165.0 sqft to 1245.0 sqft. What is the 3 bedroom size in Samridhi Luxuriya Avenue? 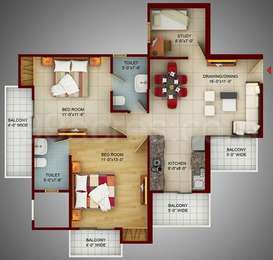 The area of 3BHK units in the project varies from 1395.0 sqft to 1690.0 sqft. What is the total area of Samridhi Luxuriya Avenue?The project spans across 11.0 Acres. What is price of 2 bhk in Samridhi Luxuriya Avenue? 2 BHK apartments in the project are available at a price of Rs. 5009500 to Rs. 5353500. Samridhi Realty Homes is an eminent name in the real estate industry. The company is led by the mission of executing projects with meticulousness while also adhering to timeline and has delivered numerous successful projects. It believes in quality rather than quantity and strives to create new standards through its projects which bear highest standards of quality. It follows the principles of quality, timely delivery and transparency and aims to develop quality residential and commercial projects all over the country. Is the proposed metro nearby Samridhi Luxuriya Avenue operational? Does the area have other transportation facilities like bus available? Hi Rajan, Samridhi Luxuriya Avenue is located in sector-150 of Noida. The aqua line metro network covers this sector along the Noida-Greater Noida expressway. You can access the metro facilities from the sector-148 metro station located 5.5 km away, which is operational now. This is a developing locality with excellent road connectivity, but it lacks public transport facilities. You need to drive nearly 11 minutes to the Noida-Greater Noida expressway to get a bus from Bus shelter no.9 of sector-153. However, autos, private cab services- ola/uber are easily available. Suggest you to get your own vehicle if possible otherwise commuting becomes an expensive affair. Please guide me about the locality around this project- Samridhi luxuriya avenue. Also, elaborate about the social infrastructure particularly public transportation?